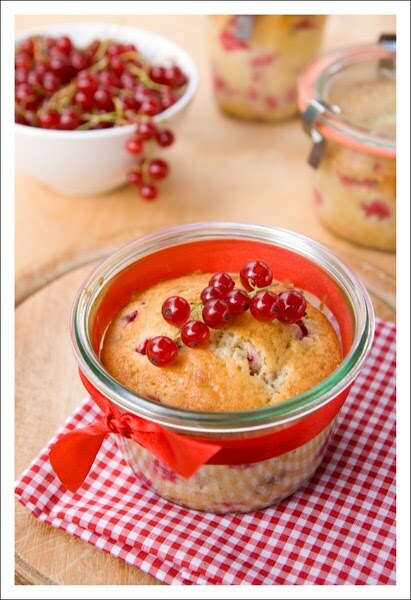 Red currants are still in abundance in our garden, so I made a batch of little cakes in glass jars to preserve them. I have made some cakes in glass jars before, and they make a really nice gift. You don't need any special glasses, anything heatproof, like jam glasses, with a wide opening works fine. Of course you can also bake them in a regular muffin pan. The special ingredient here is muesli, which will give you a mix of oatmeal and other good things, like nuts or dried fruits. You can choose any muesli type you like, but it must be a dry type. Granola is also not suitable. Butter your heatproof glass jars or jam glasses. Preheat the oven to 180° Celsius (350°F). Clean the red currants, take them off the stalks and let dry. Add 1 tbsp. of the flour to coat the berries. Mix the butter, sugar and vanilla until creamy. Continue mixing and add the eggs, one at a time. Mix in the sour cream. Fold in the flour, baking powder and muesli. At the end carefully fold in the currants. Fill the dough in the prepared glass jars to about ¾ full. Put in the oven and bake for about 30-35 minutes. Let cool on a wire rack. If you want to seal the glass jars do so right after you get them out of the oven. They have to be very hot to build a vacuum. The cakes will last in the glass jar for about 3-4 weeks, if stored in a cool dark place.